Tracking shots have traditionally been the preserve of the professional filmmaker or broadcaster, first with cameras on dollies and tracks, then with Steadicam and now there are cable or wire systems (SkyCam) that can move in three dimensions to get some really amazing shots. While these are all still expensive, the amateur filmmaker can achieve a similar effect with Wiral Lite at a fraction of the cost. Todd hangs tight with Emilie. The Wiral Lite system consists of a steel cable plus a motorized camera mount - the cable cam - that hangs from the cable and it's a little like a miniature cable car. The cable is strung between two strong points, say, a couple of trees or street lights, and the cable cam is hung on the wire under tension. It needs the tension so that the rubber wheels can grip on the cable and move about. Cameras up to 1.5 kg / 3.3 lb. can be carried by the cable cam so it can easily hold a GoPro. The remote control moves the cable cam back and forth on the cable with adjustable speed. 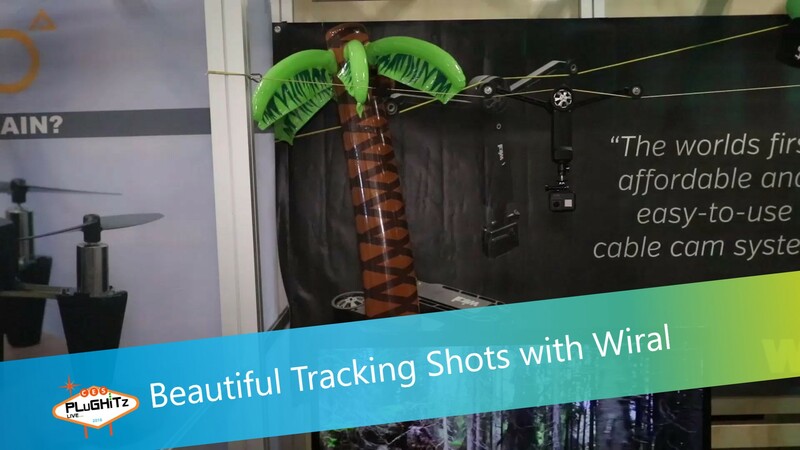 The Wiral was successfully funded on Kickstarter in the autumn raising over $1,000,000 and is now also crowdfunding on Indiegogo. There are currently perks at $239 with delivery expected in August.